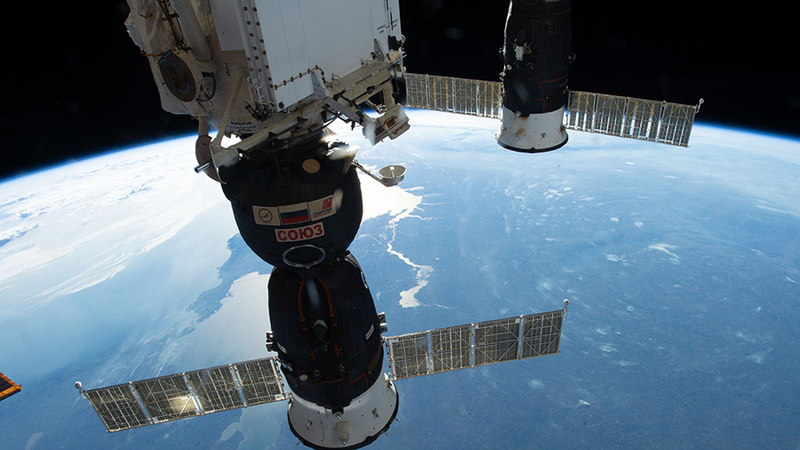 Two Russian spacecraft, the Soyuz MS-09 crew ship (foreground) and the Progress 70 resupply ship, are pictured docked to the International Space Station as the orbital complex orbited nearly 257 miles above Ukraine. Two Expedition 57 astronauts are working to understand what happens to fluids being transported by spacecraft today. Another crew member also worked on combustion science gear as well as Japanese and Russian systems. Fluid physics and combustion research on the International Space Station helps scientists understand how well-known phenomena on Earth behaves in microgravity. For instance, fluids sloshing around inside fuel tanks can impact how a spaceship steers in space. The way flames burn and create soot in space can also create safety issues for crews. Flight Engineer Serena Auñón-Chancellor and Commander Alexander Gerst of ESA (European Space Agency) explored how fluids affect spacecraft maneuvers today. The duo set up a pair of tiny mobile satellites known as SPHERES for the test inside Japan’s Kibo lab module. The SPHERES Tether Slosh experiment is observing what happens when the satellites tow a liquid-filled tank versus a solid mass body with a Kevlar tether. Sergey Prokopyev of Roscosmos opened up the Combustion Integrated Rack in the afternoon and replaced manifold bottles that contain gases for flame experiments. The flight engineer also packed items for disposal on a Japanese cargo ship and checked on Russian ventilation and air conditioning systems. In order to design and build the best system able to make the procedures of production Oxygen as ordinary operations in continuously procedure at a fastest case and efficiency to support life on the board of The International Space Station, we should determe and overcome the physics challenges in this field. The main challenge for recycle Carbon dioxide in the air into water to be converted into Oxygen is The Low VALUE OF DISSOLVABILITY OF CARBON DIOXIDE IN THE WATER and THE SLOWLY CHEMICAL REACTION BETWEEN CARBON DIOXIDE MOLECULES AND WATER MOLECULES at The Laboratory Circumstances, therefore it is a very important to determine the unique physics circumstances for these Physics activities such the best value of Temperature, Pressure and the value interfere surface required of these materials as well as determining materials which may increase these activities without any side effects (on Earth’s labs) to design the best system able to make these procedures on ISS at fastest case possible for the life-support system on the International Space Station. These values of the mentioned physics circumstances is different for these Physics activities (solving and dissolving materials and the chemical reactions of the input Materials ) in system’s reactor, therefore the system of generating Oxygen should always change these physics circumstances as a technical path to keep the required operations in continuously procedure, therefore each step of these operations should be a title of thesis or postdocs in universities under highest care and observations to find the most perfect data to build the system of production Oxygen as ordinary operations in continuously procedure able to support the life either on ISS or the spacecrafts during future’s missions of the long space journeys. 1- The Surface tension of bubbles is in higher Stablity due to the absence External forces such the gravity force. 2- According to the previous notification from ISS, the humidity on ISS is at a very high values, this may reduce evaporation rates of the water from the surface of bubbles that keeps amount of water on the surface of bubbles more stable finally will Extend bubbles life. Even on the Earth at the Laboratory Circumstances we could extend the life of babbles for any liquid via increasing the humidity of the air around the bubbles ( if the main material of the bubbles is water such coffee), for the rest of materials we may control the size of bubbles via reducing the surface tension of the water, such adding Sodium hydroxide NaOH or Calcium hydroxide Ka(OH)2 exactly like the detergent materials. Because the foams compose of numerous bubbles in the liquid and each bubble compose of gases of the atmosphere around and the foams is a very important issues in the chemical reactions because it increase the interfere surfaces of materials of the the chemical reactions, if the goal is increasing the activeties of the chemical reactions then we should focus upon factors that may stablizing bubbles and foams in the chemical reactions and vise-versa if the goal is reducing the effects the chemical reactions we should find factors that may demolish bubbles and foams such using the mechanical vibration. Also the temperature of the liquid have an active influences upon the Stability of the bubbles, where as much as the temperature is higher that may increase the evaporate ratio of the liquid of the bubbles then reduce the Stability of the bubbles and foams. Note: The air pressure on ISS is lower than the atmosphere pressure on the surface of the Earth this may also have some influences either directly or indirectly due to changing the balance circomstances between the surface tension of the babbles and forces around remember increasing the chemical stabelty of the liquid material of the babbles with the atmosphere elements around also increase stabelty of the babbles to keep them stay together for longer time and this is a very important part may Support the chemical reactions in the system of producing Oxygen and recycle Carbon dioxide in the air into water to be converted into Oxygen as ordinary operations in continuously procedure able to support the life on ISS and test of spacecrafts. Briefly The foams is a big issue and there are a number of factors have the influences upon their half-life, size, density etc. and it’s not a merely the issue of a micro-gravity on ISS but a several factors may been created due to the micro-gravity environment on ISS.